As the elevator doors opened on the 21st floor of the Meliá Hanoi hotel on Monday morning, a tall North Korean glared at a Chosun Ilbo reporter and pointed down with his hand. The reporter said, "I'm a guest here. Are you from North Korea?" but the North Korean continued to gesture down without saying anything. So it is the Meliá where North Korean leader Kim Jong-un is expected to stay during his visit to Vietnam for the second summit with U.S. President Donald Trump. Already the 17th to 22nd floors are off-limits to civilians because North Korean officials and Kim's security personnel are staying there. A suite on the 22nd floor appears to have been reserved for Kim. 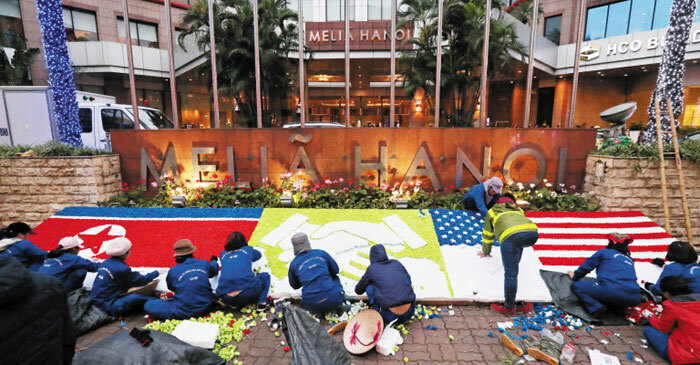 Workers make North Korean and U.S. flags out of paper-flowers in front of the Meliá Hanoi in Vietnam on Monday, ahead of the second U.S.-North Korea summit. The alert seemed even tighter than during the first U.S.-North Korea summit in Singapore in June last year, when North Korean security staff mingled awkwardly with other guests in the hotel restaurants. But at the Meliá, they eat by themselves in a sealed-off ballroom and lounge bar on the 20th floor. Hotel staff set up a security checkpoint they claimed was part of "protocol" for a visiting head of state. White House correspondents are expected to set up their press center at the hotel as well. Security was tightened also at the nearby Sofitel Legend Metropole Hanoi, where the summit is expected to take place, and the JW Marriot, where U.S. President Donald Trump, ever the brand addict, is expected to stay. Soldiers constantly combed the grounds for explosives and checked windows, sofas and even coffee cups for hazardous materials. Meanwhile, an Australian going by the name of Howard X, who has become an internet sensation for his uncanny resemblance to the North Korean leader, was deported from Vietnam on Monday.